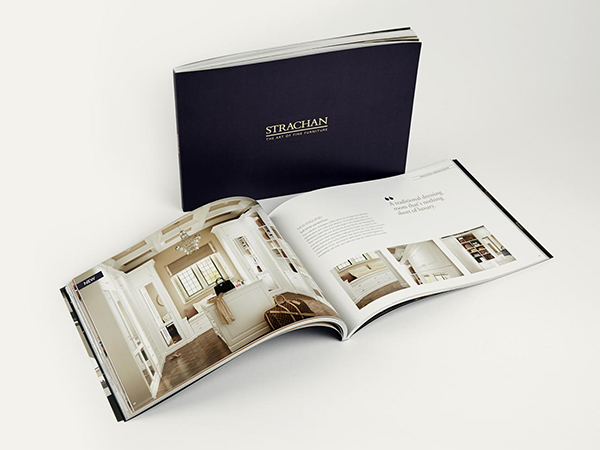 Dr Shahmalak from Cheadle contacted Strachan looking for a modern and stylish design for his son’s bedroom. He required a bespoke solution for the sloping ceiling, along with a variety of integral storage features, matching furniture and an on trend finish that would stand the test of time. 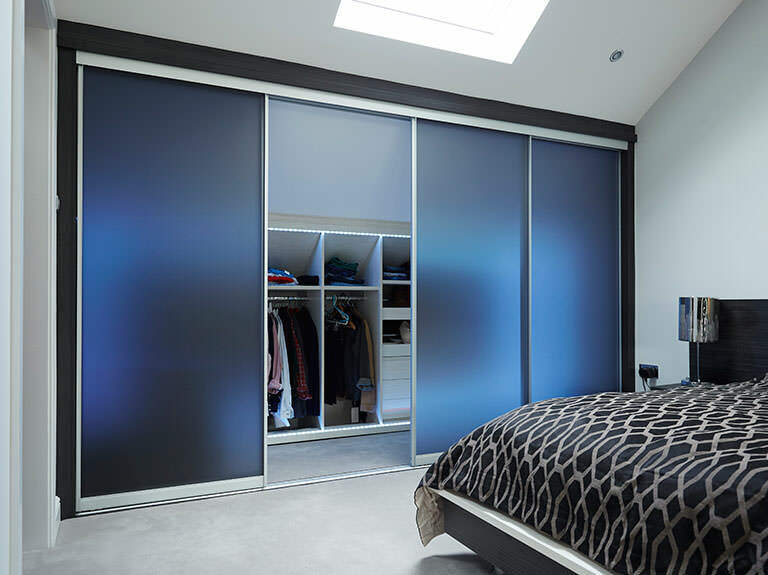 In order to maintain the spacious layout of the bedroom without compromising on storage, a contemporary sliding door wardrobe design was installed beneath the sloping ceiling. Complete with a bespoke translucent black finish and standard soft close function, it’s a modern comfort and stunning statement in one. The customer also added LED blue lighting for an eye-catching touch. Strachan can provide similar lighting features to suit your project. To really utilise the bedroom’s apex, the sliding wardrobe doors were fitted flush against the ceiling slope, leaving plenty of space inside. 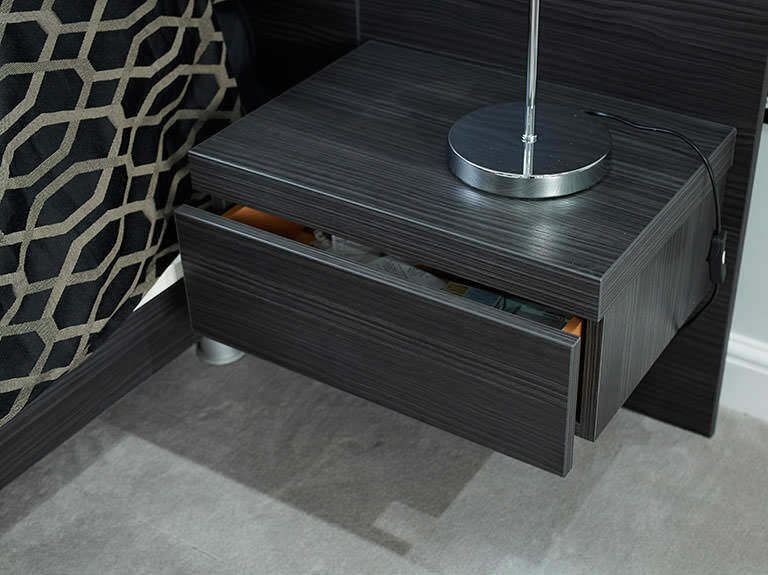 While the internal storage was configured with carefully considered features, such as soft close drawers, hanging rails and slide out shoe racks, the floor space in front left enough room for the customer to step inside and browse his collection with ease. 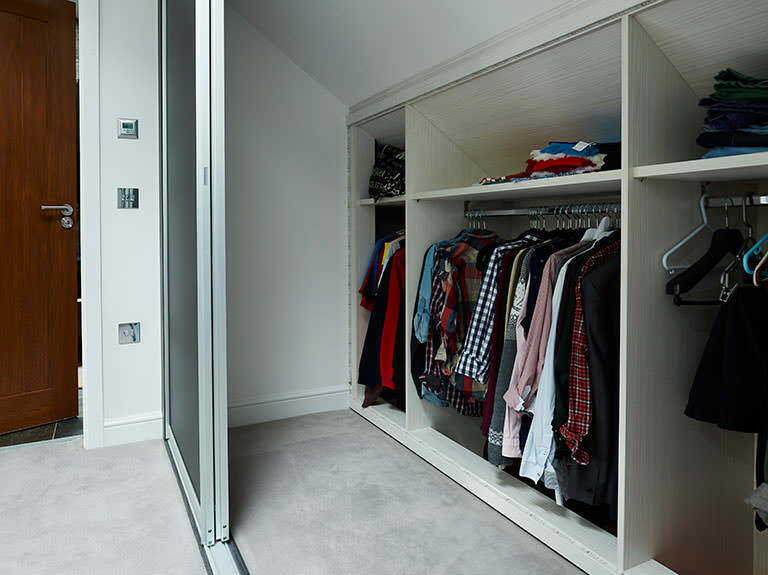 The room had an unusually spaced area, which needed to be integrated with the bespoke wardrobe solution. This included an area of dropped flooring. The designer utilised this to provide additional storage, which is ideal for stowing away bags and cases below the hanging clothes. Not all of these items could be accommodated on the shelf above the hanging rails due to the angle and proximity of the sloping ceiling. In order to maintain the dark colour palette throughout the room, we also designed and handcrafted a matching shelving unit in our Aura finish. 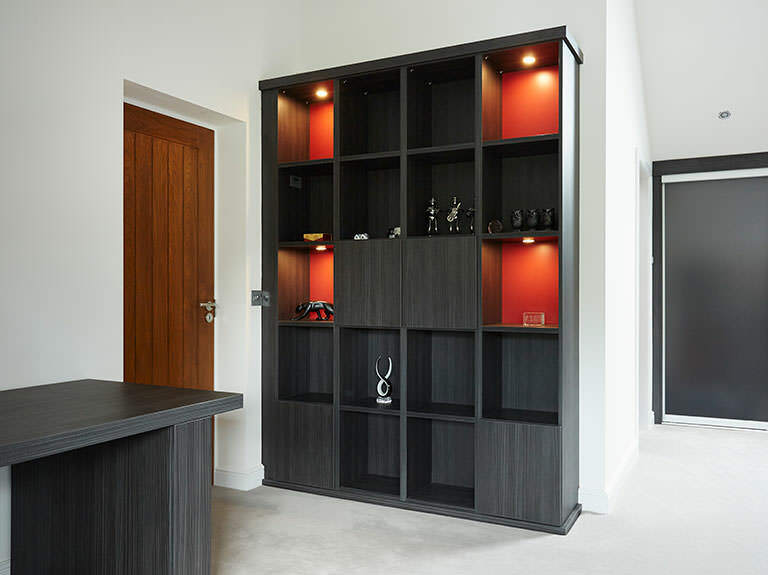 The contemporary Capri design beautifully blends with the sharp lines of the feature wardrobe, while the eye-catching red painted backs and LED down lighting delivers a feature colour for an eye-catching look. 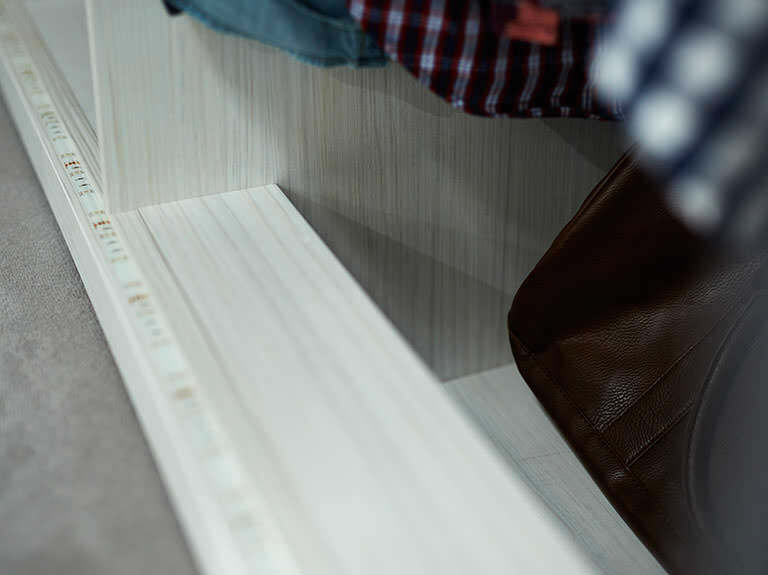 Along with the open spaces, the fitted shelves were also configured to include concealed compartments. 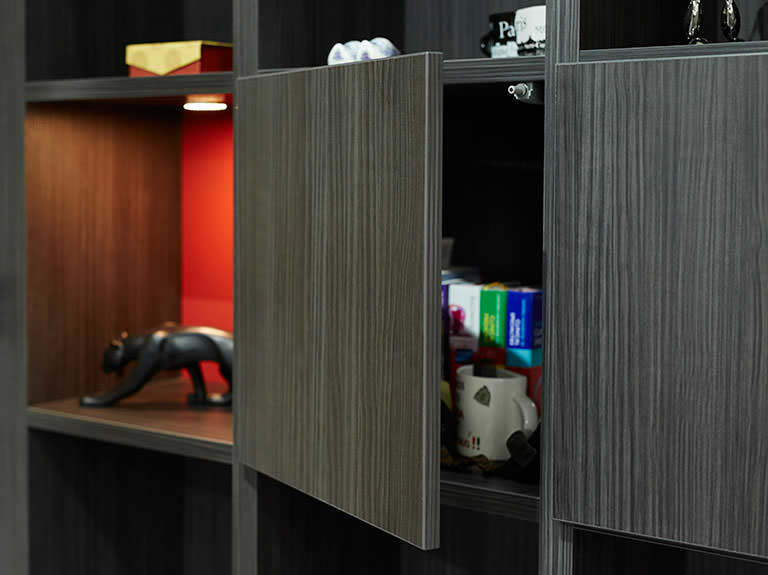 These compartments are ideal for storing personal items neatly out of sight without interrupting the streamlined aesthetics of the display cabinet. No handles were fitted. Instead a discreet push to open mechanism was installed for access to the cabinet. For comfort and convenience, our designer included a bedside table, which was seamlessly integrated into the matching Aura headboard. The floating design saved floor space while also adding a contemporary touch. In addition to the surface on top, which was ideal for a lamp and alarm clock, internal space was also available inside the drawer. We crafted a ledge style bed and headboard to accommodate the exact measurements of the customer’s mattress, meaning they could continue to enjoy their current mattress without the need for a replacement. 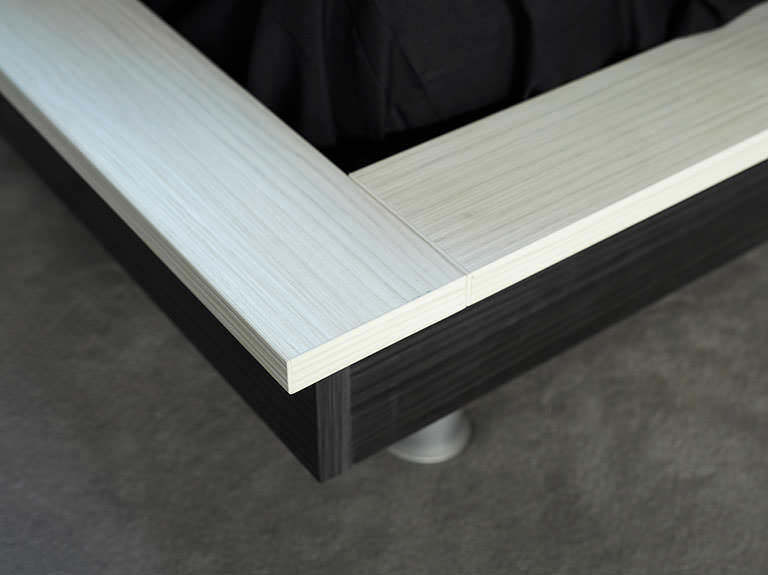 For an on trend finish, the sides of the bed surround were crafted in the dark Aura finish, which was beautifully complemented by the ledge surround in a Pearl finish for a bespoke contrasting effect. 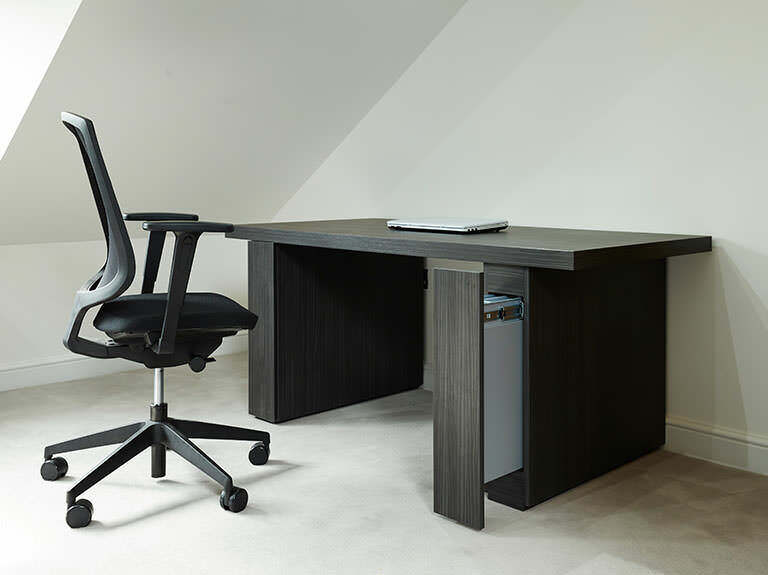 A desk was crafted in the matching Aura finish, providing a dedicated work space for the customer. The freestanding design has a minimalistic look, along with an ample area for work or study, while the sharp lines of the Milano range give it character. Two pull out pilasters were installed on either side, delivering discreet storage for stationary and documents.